Derrick Kosinski & Scott Yager are joined by Paulie Calafiore. Love him or hate him, say what you will about Paulie Calafiore (@PaulCalafiore_) but he has been one of the standout performers on this season of War of the Worlds. Alongside his partner, Ninja Natalie, he has performed well in daily challenges and even this past week when finally thrown into elimination against Kam and Ashley. Paulie returns to Challenge Mania, having vowed to both Derrick (@DerrickMTV) and Scott ... See More (@SHOTOFYAGER) that he would limit his F-bomb count after his last podcast appearance was so littered with profanity it even made Quintin Tarantino uncomfortable. What we get is a thoughtful 2 hour discussion about Final Reckoning, War of the Worlds, the state of The Challenge and thoughts on some of his competition. 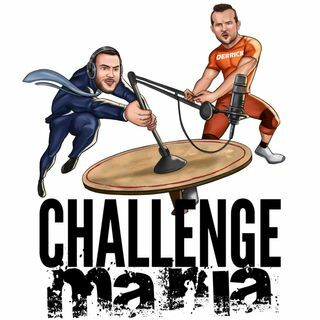 If you want MORE Challenge Mania, including our weekly episode breakdown podcast THE WAR ROOM, that goes up a few hours after each episode of War of the Worlds, head over to www.Patreon.com/ChallengeMania and become a patron of the show! Join the POD SQUAD! Head over to www.GetQuip.com/MANIA and check out our favorite electric toothbrush. They'll hook you up with your first refill pack FOR FREE! As always, when you get the Poshmark app, if you use the code CHALLENGEMANIA, you get $5 off your first purchase. Why wait, go buy some of Jenna Compono's clothes TODAY and save $5 doing it!